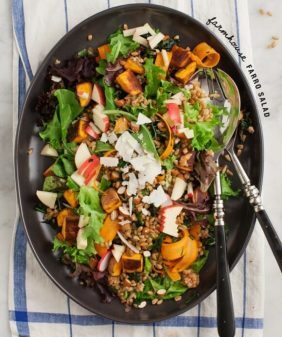 Pumpkins and sweet potatoes seem to get all of the fall love. Rightfully so, but lately I’ve been having a mini obsession with pears. One day last week, pear pizza sounded like a good idea to me. No, I mean, literally, I just liked the way it sounded… with the two p’s. 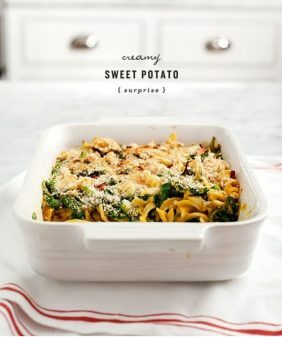 I love a sweet component to savory foods, so I knew this would be good – I didn’t know this combo would be ridiculously good. While we were snapping photos, I let Jack have that missing slice. I knew we had a winner when he took a bite and his eyes lit up with excitement and surprise. Those eyes, they don’t lie. And they also don’t appease me. 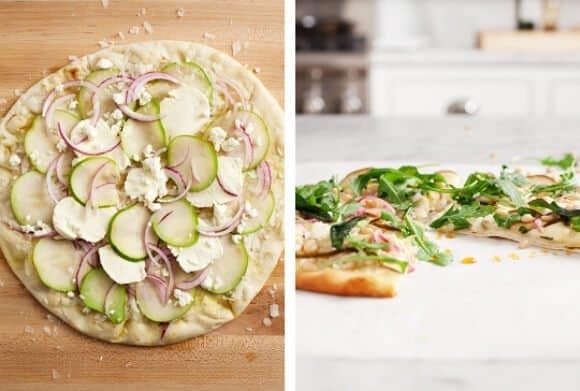 The key here is that you want everything pretty thin – you don’t want dough that’s too doughy or huge chunks of onion or pear. You want those first few layers to nicely melt into each other. And don’t skimp on the fried sage – it’s quick, easy and it’ll make your house smell like fall (and also strangely a little bit like McDonald’s breakfast sausage). I used store bought pizza dough here, but I’ve had success with this recipe in the past. If I were to veganize this one, I would sub in daiya cheese and maybe drizzle some reduced balsamic on top at the end. Pears are great sub for apple in my opinion. I see a lot of apple recipe right now and I always wonder if they be goo or better with pear. Rightfully so you pay attention to less loved fruits and veggies, I hope more people follow your lead. Love the flavour combo, yum! 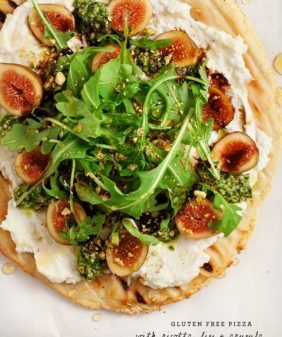 This pizza look lovely – I love lighter toppings like these! 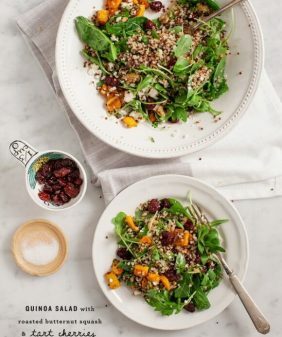 This sounds such a light & bright combination of flavours, love the hint of sage in there too. I too, like a little sweet with my savory (which is why I add balsamic vinegar to almost everything). Also, thanks for always adding a vegan option. I really appreciate you thinking of us vegans! ha, me too, I love balsamic way too much! Absolutely lovely pizza. We have hundreds of pear orchards next to our farm and I am definitely making this soon! yum. Love a pizza bianca! Think they’re so underrated! 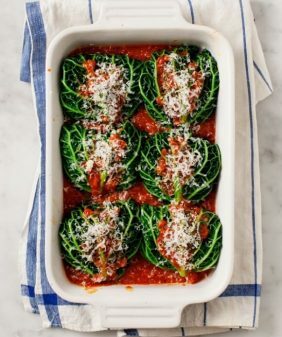 Will definitely be trying this out on my Italian friends! I love pears! What a unique and gorgeous flavor combination. 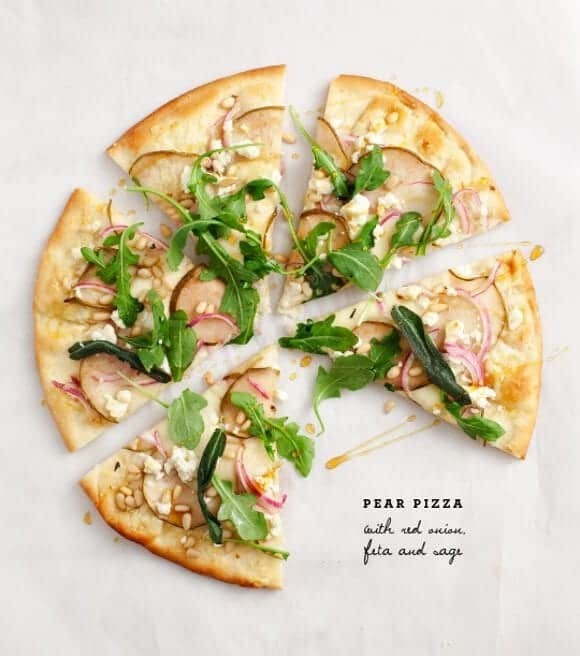 What a great idea to add pears on a pizza – I’m gonna try this recipe! Hahaha! I can’t wait to see if it really does smell like McDonald’s! I am super excited for pomegranates on addition to pears and pumpkin and squash! This pizza is a perfect girls night fancy pizza! Um, can I come and eat the left overs??? Oh wait, there are none… I mean, how could there be?! I tend toward non-traditional pizza toppings anyway… ie: whatever is in my fridge! But, this combo sounds like a keeper. oh my goodness this looks fantastic! Also think it would be great with chèvre. Pear and chèvre works so well together. Made this for dinner last night and it was delicious! The flavor work perfectly together. oh I’m so happy to hear! Thank you for coming back to comment! Made this last night on two naans (the lazy person’s personal pizza crust) and it was amazing! 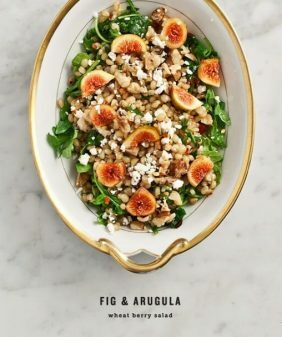 The only other substitution I made was walnuts instead of pine nuts as that’s what I had on hand – will definitely be making this again. Hi Katie – I’m so glad you loved it!